It is generally claimed that brand names are a corporate asset with an economic value that creates wealth for a firm’s shareholders. However, the scholarly literature has neither provided a comprehensive theoretical basis for this claim nor documented an empirical relationship between brand value and shareholder value. This exploratory study describes a rationale for, and documents, the statistical strength and functional form of a brand value-shareholder value relationship for publicly held consumer goods companies in the United States. 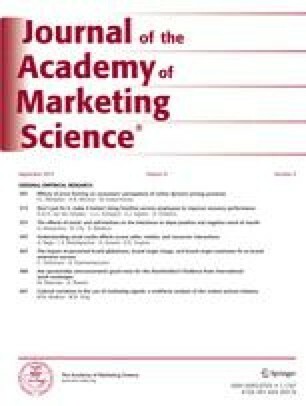 A theoretical argument supportive of a positive relationship between a firm’s accumulated brand value and market-to-book (M/B) ratio was empirically validated. However, even though firms with higher accumulated brand values have higher M/B ratios, the functional form of the relationship was found to be concave with decreasing returns to scale. Theoretical and managerial implications of these findings are outlined, as well as study limitations and directions for future research. Roger A. Kerin (Ph.D., University of Minnesota) is the Harold C. Simmons distinguished professor of marketing at the Edwin L. Cox School of Business, Southern Methodist University. His research focuses on marketing strategy and product management issues. He has published more than 50 articles appearing in such journals as theJournal of Marketing, theJournal of Marketing Research, Strategic Management Journal, andManagement Science, in addition to authoring four books. He presently serves on numerous editorial review boards and is a former editor of theJournal of Marketing. Raj Sethuraman obtained his Ph.D. from Northwestern University and is an assistant professor at the Edwin L. Cox School of Business, Southern Methodist University. His research focuses on competitive marketing strategies, especially price and advertising strategies. He has published in several journals including theJournal of Marketing Research, Management Science, Marketing Letters, theJournal of Business Research, and theJournal of Consumer Psychology.